Fire Truck Tours - Ride aboard a real fire truck! Daily departures from Cavill Avenue in Surfers Paradise. The siren sounds as you depart for an exciting tour to the Spit, first along the beachfront to Narrow Neck, then past the Marina's of Main Beach and Sea World. Plenty of smiles, laughs and waving to everybody to be enjoyed! At the Spit guests will be able to experience operation of a fully functional fire hose and pose for photographs holding the nozzle and wearing authentic Fire Helmets! Keep the cameras ready - Kids love sitting in the drivers seat for an up close view of the Fire Engine! Your Firefighter will then give you an introduction to the operation of the pump and controls, then it's time for another Fire Truck ride for the return journey to Surfers Paradise! Great activity for kids and families! A unique, memorable experience! Fire4Hire have a fleet of seven Fire Trucks, each seating up to 10 passengers. The trucks are equipped with a great stereo system, refrigeration for drinks, and a huge amount of storage for luggage! Services also include; Hens and Bucks, Birthday Parties, School Formals, Airport, Hotel, Theme Park Transfers, Special Events. 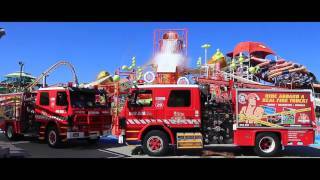 Board the Fire4Hire truck in Surfers Paradise for an exciting tour along the surfers paradise beach front to the Spit via Surfers Paradise, Narrow Neck, Main Beach, and Sea World. At the Spit guests will be able to experience operation of a fully functional fire hose and pose for photographs holding the nozzle and wearing authentic Fire Helmets! Kids love the chance to sit in the driver's seat for an up close view of the Fire Engine! Enjoy complimentary refreshments before boarding the Fire Truck for your return journey to Surfers Paradise. Ride aboard an authentic Fire Truck. Great opportunities for memorable photographs. Operate a fully functional fire hose and spray the water (all ages). Try on an authentic Fire Helmet. Enjoy the panoramic view of the Broadwater and Gold Coast City skyline. Commentary on Gold Coast history and landmarks. Guests may disembark at any time during the return journey allowing connections with other activities / destinations along the way. Approximate time on location at the Spit - 20 minutes.